Following an apocalyptic Third World War, the strict government of the city-state Libria has eliminated war by suppressing all human emotion. In the monochromatic and sedated society, artifacts from the old world (works of art and music that may evoke some emotion) are destroyed and the population is required to take emotion sedatives. Grammaton Cleric Preston (Bale), a man trained to locate and arrest those guilty of feeling emotions, finds himself abandoning the drug and experiencing outlawed feelings. As he struggles to conceal his feelings from his superiors, colleagues, and family, Preston finds himself drawn into a sinister world of double-crossings and lies, and becomes an unwitting pawn in a sophisticated plot which ultimately changes the repressed society forever. This movie offers an ominous glance into a rather cold Brave-New-World futuristic type of society, in which Huxley’s premonition of a society in which its inhabitants are (voluntarily?) sedated by “happy pills”, to combat states of depression, anxiety, sorrow and all the rest of it… has now been replaced by the actualization of a society in which its members are mandated to self-administer a medication that radically suppresses feelings altogether. It so happens that the leaders of society have decided, no doubt after a long and profound act of deliberation (sarcastic joke), that, based on the presumption that unchecked human emotions are the leading cause of all the misery in the world in general, and war in particular, it was simply the best thing to altogether eradicate the full scope of human feelings. To endow such an abhorrently dystopian society with functionality, a Big Brother-like Police State is established, in which human emotions are unilaterally outlawed and suppressed and behavior gets to be ruled by reason, exclusively. Police officers are typically dressed out in black gestapo-like uniforms with long overcoats and wearing motorcycle helmets that serve to not only protect the head but to also obfuscate the officers’ identities. Through making the police more anonymous an instant distance is created between them and regular citizens, especially the considered enemies of the state, who simply are the people who are still able to feel: so-called “Sense Offenders.” Compare the police of yesteryear with the police of today, especially in the US, to observe that the (predictive programming) theme of the militarization of the police is already coming to fruition. To drastically enforce preventing people from having emotions at all, the drug Prozium needs to be administered several times a day by means of automated inoculations. All civilians are mandated to take this essentially zombifying drug. As such, a pale and robotic kind of society emerges out of the ashes of the devastation brought on by a cataclysmic nuclear WWIII. Regarding predictive programming this movie is not the best way to try to peddle any government intentions of mandatory public drug use, but still the viewer are being prepared nonetheless. Also note that the movie allows for the possibility that the leadership does not require to take sense-numbing medication. Let’s now focus on somewhat less apparent predictive programming elements. First off, it is not too hard to detect similarities between the society painted in Equilibrium and former Nazi Germany. A banner-flag featuring the Teutonic Cross suggests rule by the Teutonic Order. So who are the Teutonic Knights? In 1143 Pope Celestine II ordered the Knights Hospitaller to take over management of a German Hospital in Jerusalem, which, according to the chronicler Jean d’Ypres, accommodated the countless German pilgrims and crusaders who could neither speak the local tongue (i.e. French) nor Latin (patrie linguam ignorantibus atque Latinam). However, although formally an institution of the Hospitallers, the pope commanded that the prior and the brothers of the domus Teutonicorum (house of the Germans) should always be Germans themselves, so a tradition of a German-led religious institution could develop during the 12th century in Palestine. The Order continued to exist in Austria, out of Napoleon’s reach. Beginning in 1804 it was headed by members of the Habsburg dynasty until the 1923 resignation of the Grand Master, Archduke Eugen of Austria. In 1929 the Teutonic Knights were converted to a purely spiritual Roman Catholic religious order and were renamed Deutscher Orden (“German Order”). After Austria’s annexation by Nazi Germany, the Teutonic Order was suppressed throughout the Großdeutsches Reich from 1938-1945, although the Nazis used imagery of the medieval Teutonic Knights for propaganda purposes. The Order survived in Italy, however, and was reconstituted in Germany and Austria in 1945. By the end of the 1990s, the Order had developed into a charitable organization and incorporated numerous clinics. It sponsors excavation and tourism projects in Israel and the Palestinian territories. In 2000 the German chapter of the Teutonic Order declared insolvency, and its upper management was dismissed. A 2002-03 investigation by a special committee of the Bavarian parliament was inconclusive. German nationalism often invoked the imagery of the Teutonic Knights, especially in the context of territorial conquest from eastern neighbours of Germany and conflict with nations of Slavic origins, who were considered by German nationalists to be of lower development and of inferior culture. The German historian Heinrich von Treitschke used imagery of the Teutonic Knights to promote pro-German and anti-Polish rhetoric. Such imagery and symbols were adopted by many middle-class Germans who supported German nationalism. During the Weimar Republic, associations and organisations of this nature contributed to laying the groundwork for the formation of Nazi Germany. Emperor William II of Germany posed for a photo in 1902 in the garb of a monk from the Teutonic Order, climbing up the stairs in the reconstructed Marienburg Castle as a symbol of the German Empire’s policy. 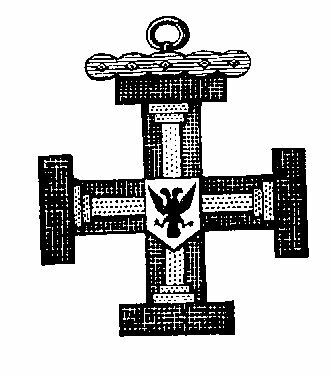 During World War II, Nazi propaganda and ideology made frequent use of the Teutonic Knights’ imagery, as the Nazis sought to depict the Knights’ actions as a forerunner of the Nazi conquests for Lebensraum. Heinrich Himmler tried to idealize the SS as a 20th century incarnation of the medieval knights. Hence, as the Nazis and the Teutonic Knights went hand in hand, it can be safely assumed that Libria essentially is ruled by Nazism. As good hospital-operating Teutonic Knights do, Libria’s leadership approaches the problems of society as a medical problem, which, according to good allopathic (German) tradition enthuses over treatment with pharmaceuticals, applied in the characteristic “obey-the-doctor-or-else” brute-force fashion. The rationale for resorting to drastic measures being that since no success has been obtained in controlling unchecked human emotion (considered the root of all the world’s problems) using relatively non-invasive means, it is decided best to simply chemically anesthetize feelings altogether; indeed a very radically intolerant and invasive approach that is most compatible with Nazi (medical) ethics. Of course the movie never even remotely addresses the idea that the prevalence of war basically has more to do with sinister shadow politics engaged between filthy rich and megalomaniacal men than it has to do with the emotional incontinence of the ordinary masses. The viewing crowd is lured into believing that the phenomenon of war is basically all the fault of the typically over-emotional Joe Six-pack and Jane Soap-opera. In addition, the head of state is referred to as Father so as to signify the clerical head. In the Roman Catholic Church the Pope is referred to as the Holy Father. So those are pretty clear additional hints. Later in the movie a scene is shown in which a “Sense Offender” is burned alive in a furnace much like the heretics of old were burned alive at the stake in the vain hope of “purifying the soul with flames”. This was an all too common happening during the times of the Spanish Inquisition which, by the way, was administered by the Roman Catholic Dominican Order as well as the Jesuit Order. In addition, the scene is also reminiscent of the existence of disposal furnaces present in Nazi Germany, which functioned to get rid of corpses of persecuted political dissidents and so deemed racial adversaries. As an aside, the word Holocaust derives from Greek and means Sacrificial Burnt Offering. Only a blind person could now possibly still deny the parallels between the leadership showcased in the movie and the Roman Catholic clergy. This revelation comes as little surprise since it has been quite clearly demonstrated, by a number of anti-Vatican researchers such as Eric Jon Phelps and Thomas Richards, that indeed the conception of Nazism as well as its operation was greatly facilitated by the Roman Catholic Church itself. Internet references abound to prove the cooperation between the two. First one may learn of the setting up of a Reichskonkordat between the Vatican and Nazi Germany. NB: A concordat is a legally binding mutually beneficial agreement between some governing body and the Papacy. To further disclose the connection between Nazism and the Vatican there is the still ongoing class-action lawsuit where survivors of a WWII-era Croatian genocide have pressed charges against the Vatican Bank (IOR). It is remarkable, to say the least, that the Vatican admitted wrongdoing but it claimed it was justified under international law. Google. It is therefore hardly a stretch to call Nazism a Catholic invention, or at least a profoundly Vatican-backed enterprise. It should come as little surprise that many of its leaders were, in fact, of Catholic nomination, including Hitler, Goebbels, Himmler, Von Papen, Bormann etc. So to recap, here we have a movie that drew its inspiration heavily from Roman Catholic Nazi Germany and modeled its leadership themes consistent with specific Catholic Orders (Jesuits and Teutonic Knights), much as it happened in real-life history also. It nonetheless is just as Nazi-like in character and practice as the original was. The only difference being that in the movie there is no external enemy to be slain or conquered, its persecution is confined only to dissidents of the State. Thus, in essence, nothing has changed: Nazism still rules the world. Unfortunately, the mass-citizens are too sedated and too disengaged to notice, also much like the real-life situation today. I hesitate to rank these movie-elements under the category of predictive programming as it also reads like a warning for a dystopian society. If it can be rightfully called predictive programming, then I believe it is to inform the public that nothing will change in the future, we will still be governed by Nazism, no matter what. The parallels between Libria’s government and 1) Nazism and 2) Roman Catholicism, are so overwhelmingly obvious that it puzzles me, quite frankly. After all, would the Roman Church really welcome the release of a movie that expands on the historically documented fact that Nazism and the Vatican were once happily wedded together? It almost seems that this is indeed the intent of the movie; to instill, perhaps on a subconscious level, a deep fear, hatred and/or disgust for the Catholic Church. After all, wasn’t it Machiavelli who said that to rule through fear is much better than to rule through love? Perhaps more programming can be gleaned from the nature of the conclusion of the movie. To save society from the horrible clutches of absolute and soul-numbing tyranny, the main cleric fortunately comes to his senses (thank golly) and decides to switch sides and join the network of Sense Offenders so as to ultimately succeed in killing the Librian clerical leader (Father). The suggested programming seems to be that it doesn’t really matter if Nazism still rules today, some day, sooner rather than later, a saviour will emerge, deliver us from evil and we all will live happily ever after. So the viewer may just as well happily sit back, relax, do nothing and just enjoy the show! With movies like these, are we to be persuaded into believing that (renegade members of) the Jesuit Order ultimately will save us from absolute and abject tyranny? Indeed, perhaps the programming lies in the movie giving hope to the viewer that, when crises similar to the one shown in Equilibrium, there will always be valiant turncoat formerly inimical hero-types capable of saving the day. That this may very well be a vain and false hope in practice would, no doubt, be something that Hollywood is reluctant to acknowledge through their own movies.